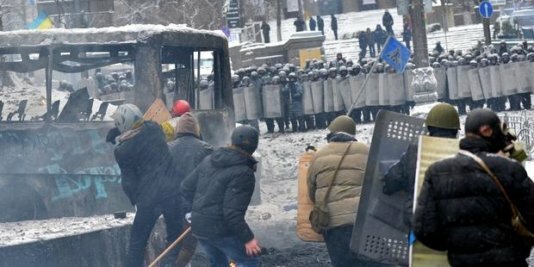 The use of live ammunition by police in Kiev would only increase what is already a highly volatile situation, Amnesty International said today after four protesters were killed and the government issued a statement saying that police may start using live ammunition. The death of a man after being brutally beaten by two riot police officers is another example of pervasive police impunity in Ukraine. Video footage shows a sustained attack by the two officers beating and kicking the man on top of the colonnades at the entrance to the Dynamo Kiev football stadium on Monday, before dragging him away. “There must be no impunity for law enforcement officers who resort to abusive use of force. We have repeatedly called on the Ukrainian authorities to bring perpetrators to justice, but today’s unlawful violence by the police has led to at least one death. What else needs to happen before police officers are held accountable for human rights violations?” said Heather McGill, Amnesty International's Ukraine expert. Three others protesters were shot and killed by unknown persons including reportedly a sniper firing from a sixth floor window. The police have denied that they are using live ammunition. Other law enforcement agencies have not commented whether they have done so. The man killed by a sniper has been identified as Serhiy Nikoyan, a 20-year-old from Dnipropetrovsk in the southeast of Ukraine. Both the coordinator of volunteer medics working at Euromaydan and the Ministry of Internal Affairs have confirmed that his death was the result of being shot with live ammunition. Belarusian news media has reported that one of the other two men killed by live ammunition was a 30-year-old Belarusian, Mikhail Zhyzneuski. The Ministry of Internal Affairs has denied that it was using live ammunition but has threatened to use live rounds following the shootings. In a statement on its website it said: "If it is confirmed that participants in mass disorder have used firearms the police will be justified in using firearms in accordance with Article 15 of the Law on the Police.” There has not been any confirmation that any of the protesters have had firearms, and the identity of the shooter remains unknown. "The Ukrainian authorities must remember that law enforcement officers should use firearms only when strictly unavoidable in order to prevent an imminent threat to life or a life-threatening injury," said Heather McGill. "Impunity for law enforcement officers in Ukraine is already a serious problem, and the decision to permit the use of live ammunition in this context is alarming." The overwhelmingly peaceful demonstrations in Kyiv turned violent on Sunday night after the government introduced a series of new laws criminalizing protests and severely limiting freedom of assembly, association and expression on Thursday. The new laws came into effect on Wednesday, 22 January. "The Ukrainian authorities must do all in their power to stop the escalation of violence in Kyiv before more people are killed. If, as they say, they are interested in a peaceful resolution of the ongoing political crisis in the country they should respect the people’s rights and not seek to take away their freedoms through sweeping legislation, crushing of peaceful protest and allowing police to use abusive force with impunity," said Heather McGill.